A Mexican cooking utensil that literally translated means "stone mortar" and is most often used to refer to both the mortar and pestle. 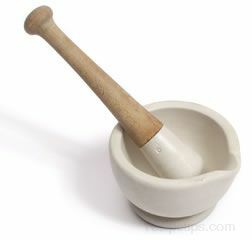 "Molcajete tejolote" would be the terms used to refer to both the mortar and pestle. Typcially, a true molcajete is made from lava rock that provides a rough surface which helps to grind chiles and other ingredients for many of the popular salsa and sauces used with Mexican foods. Since the surface of the lava rock is so irregular and rough, the Molcajete is often "conditioned" by some who use it by placing uncooked rice kernels around the surface and grinding them into the open holes throughout the grinding areas.